ULLHAUL'S new innovative design and generous standard features set it apart from other trailers available on the market today. Its aerodynamic shape cuts down on wind drag which not only makes for a smoother ride, but also increases the Miles Per Gallon which puts money in your pocket. The Ullhaul's innovative wide open frame makes securing your load easier. Clean-up is easy and its durable primed and painted finish will keep the trailer looking great. The ratcheting tie-downs and self-storing ramps make loading and securing your loads a snap, saving you time and money. All in all, the Ullhaul Trailer was designed with you - the user - in mind. 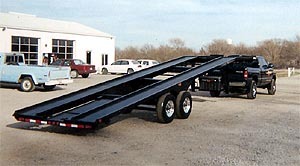 Easy Loading, Easy Clean-Up, and all its outstanding features will make you a proud owner of a Ullhaul Trailer.